These are the pages which you will always be able to control and (should) always rank no 1. These are the pages which you want people to find and they should be where everyone clicks. Note how I only have two results here but could easily use a sub-domain or other site we control to gain more spots like this. Then you have pages on sites which you clearly don't control such as SearchEngineLand & Marketing Pilgrim (no link to Spannerworks since they didn't link to us or even approve the comment I left on their blog!). Blog posts from other people which mention you can be a great page to rank since they not only take up search results but they also say positive things about you. 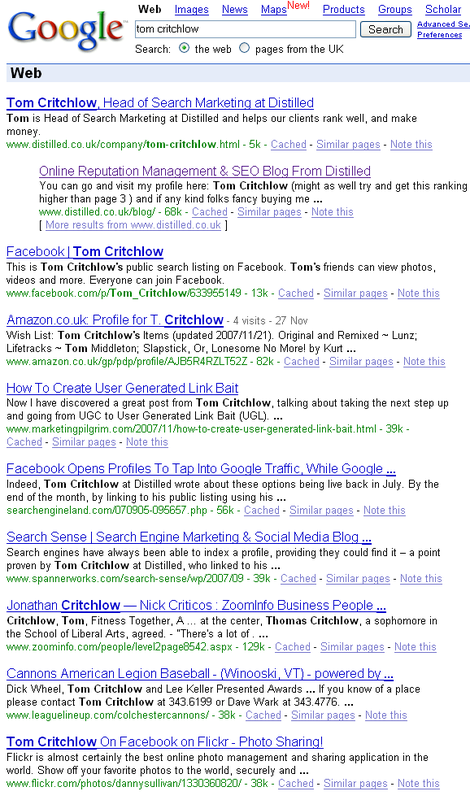 Then we see some pages which are about another Tom Critchlow (yes, there are a few of us out there! clearly no others into SEO though ;-) ). These pages are great since if someone is looking for information about me and they start seeing pages about someone else they'll most likely give up and refer back to the pages they've already seen. Also, pages like this make it look like you're not dominating the search results and make the page look more natural. The last thing you want is for people to KNOW that you're covering something up so having these pages rank is a good idea. Depending on your search term though these can be hard to come by. Sure, why not :-) - this time it's flickr which makes an appearance. This page ranks as Danny links to it from his page on SearchEngineLand. ##How do you create search results like this? Tom Critchlow works for Distilled right? SEOmoz seems to think so. Closing note - I don't have anything to cover up in the search results, hopefully you knew that anyway but thought I'd mention it just in case. I'm really just playing around here to see what works and what doesn't. I'd encourage you to do the same since playing with search results that are easy to manipulate is always a good way to learn.